Today, February 24th, marks the 47th day of session and the House of Origin Fiscal Cutoff. For those of you unfamiliar with the legislative session schedule, cutoff dates are deadlines placed throughout session. Bills that have not made sufficient progress at the cutoff date are considered “dead.” Today’s cutoff date means that all bills must be passed out of their fiscal committees by the close of business. Bills that were not approved by this deadline have “died” and will not be considered for the rest of the legislative session. The only exception to cutoff dates are for bills that are necessary to implement the budget, or NTIB. Our next cutoff date is March 8th which is the last day for the House to consider House bills and for the Senate to consider Senate bills. HB 1440: Establishes a Student Loan Bill of Rights and creates a Student Education Loan Ombuds to provide assistance to those with education loans. Requires the Washington State Institute for Public Policy to conduct a study on refinancing student loans. HB 1561: Creates an Open Educational Resource Grant Pilot Program. Required the Washington State Institute of Public Policy conduct a study on the costs of textbooks and on the use of OER. SB 5022/HB 1057: Requires that students who have obtained student loans be notified of student loan amounts, payoff amounts and monthly repayments. SB 5100: Directs each institution of higher education to take reasonable steps to ensure each student participates in a live financial literacy seminar. SB 5525/HB 1737: Requires four-year institutions to hire mental health counselors to work with military personnel, veterans, and their families. SB 5592/HB 1433: Decoupling services and activities fees from tuition. SB 5684: Creates the Higher Education Infrastructure Program by leveraging state spending on capital projects in high-demand fields of study in partnership with Washington employers. The 2017 Session Cutoff Calendar can be found here. 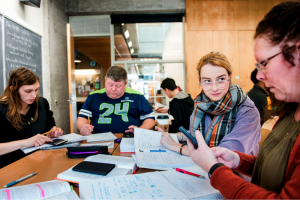 In addition to Evergreen’s budget requests, the college participates in a system-wide focus on college affordability as a top priority for Evergreen this legislative session. The State Need Grant, which provides funding to low-income students, is drastically underfunded. Over 25,000 students qualify for the grant, but do not receive funding. With over 50% of Evergreen students qualifying as low income, additional State Need Grant funding would be very impactful. Higher education is speaking loud and clear when it comes to affordability. 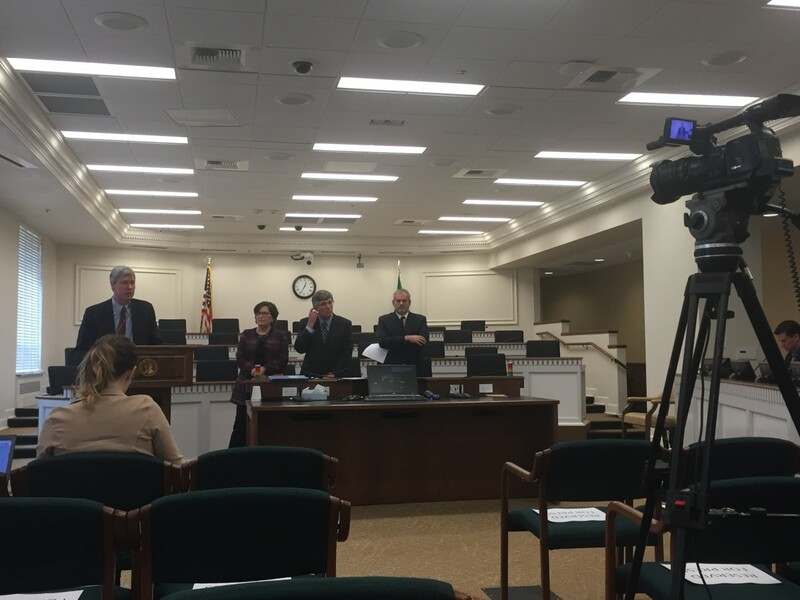 On Thursday February 2nd, the Trustees and Regents from the public four-year institutions and the State Board of Community and Technical Colleges spoke with legislators about just how vital funding higher education is in Washington. About thirty Trustees and Regents met with twenty-four legislators and Governor Inslee to express their unified support of keeping higher education funding and State Need Grant funding a priority in this biennial budget. In addition, students from across the state held a Student Aid Alliance Advocacy Day on Tuesday, February 7th with the focus of fully funding the State Need Grant. Students from all over Washington traveled to Olympia to tell legislators their stories of how the State Need Grant changed their lives. House Bill 1057 / Senate Bill 5022: Providing information to students about education loans. Requires a post-secondary institution to send a notification with education loan information, including the estimated total payoff and monthly repayment amounts, to an enrolled student who has education loans the institution has certified. House Bill 1440 / Senate Bill 5210: Establishing a student loan bill of rights. Creates the Student Education Loan Ombuds to receive, review, and provide assistance to student education loan borrowers who file complaints. Requires student education loan servicers to obtain a license from the Department of Financial Institutions (DFI) to operate in the state, and permits the DFI to establish fees. Prohibits third-party student education loan modification servicers from various practices that may misrepresent the student loan situation or encourage a borrower to do something counterproductive to their situation. House Bill 1840 / Senate Bill 5666: Establishing the Washington Promise Program. Establishes the Washington Promise Program to provide free community and technical college tuition and fees to eligible students. Provides a $1,500 cost of attendance stipend for students who have a family income that does not exceed 70 percent of the state median family income. House Bill 1169 – Enacting the student opportunity, assistance, and relief act. Establishes a student education loan debt hotline and website where borrowers can receive assistance from student education loan debt counselors on their student education loans. House Bill 1561 – Concerning open educational resources. Requires the Washington Student Achievement Council (WSAC) to administer the Open Educational Resources (OER) Grant Pilot Program for the public, four-year institutions of higher education. Requires the WSAC to conduct outreach to other states and higher education agencies to identify if there is interest in establishing a multistate OER network. Requires the Washington State Institute for Public Policy to conduct a study on the costs of textbooks and course materials and on the use of OER at the public, four- year institutions of higher education. Senate Bill 5017 – Requiring that student loan information be provided to students. Requires eligible institutions of higher education, that receive education loan information for a student enrolled in the eligible institution, to provide specific information to the student. Senate Bill 5568 – Freezing tuition at institutions of higher education. Requires tuition operating fees for resident undergraduates at community and technical colleges, in the 2017-2018 and 2018-2019 academic years, to remain the same as the fee set in the 2016-2017 academic year. Senate Bill 5100 – Requiring live financial literacy seminars for students at institutions of higher education. By the 2017-18 academic year, each institution of higher education must take reasonable steps to ensure each enrolled student participates in a live financial literacy seminar as early as possible in the academic year. Keep up to date with the current status of 2017 higher education bills by visiting the Evergreen Office of Government Relations Bill Tracker. It’s now the third week of the 2017 legislative session and the Evergreen Office of Government Relations has been busy tracking bills, following legislation heard in committee meetings, and advocating for Evergreen’s legislative priorities. The Governor’s Operating Budget was released on December 14, 2016 and includes a tuition freeze for resident undergraduate students as well as increased support for the State Need Grant, which is need-based aid for undergraduates pursuing a degree or technical training at an eligible institution. The Governor’s budget includes $116 million in additional State Need Grant dollars, which will ensure that 14,000 more students who could qualify but have not been able to receive funding will be served. The Governor’s Capital and Operating budgets, which are the first volley in the budgeting process, have been heard in House Appropriations and House Capital Budget Committees as well as Senate Ways & Means. Committee meetings are free and open for the public to observe and participate. Meeting dates, locations, and agendas can be found at www.leg.wa.gov. Follow Evergreen Government Relations Office on Twitter (@EvergreenGovRel) to read more updates on the 2017 legislative session. After 80 cumulative days in session, the Washington State Legislature adjourned sine die around 11:30 pm on Tuesday, March 29th. It marked the end of the 2016 Legislature and the special session that convened following the end of the regular session on March 10th. After hard-fought negotiations on important policy issues, the House of Representatives and Senate agreed on both a supplemental operating and supplemental capital budget. The Legislature debated 1,818 pieces of legislation, passing 292 to be signed into law by Governor Inslee. The supplemental operating budget increases spending from the 2015 biennial budget by $191 million. The Legislature prioritized $14 million towards addressing homelessness, $7 million towards recruiting and retaining public school teachers, and $41 million towards mental health programs. In addition to the new spending, $190 million was redirected from the Budget Stabilization Account (also known as the Rainy Day Fund) to address the damage done by the record-breaking wildfires of 2015. This budget does not raise taxes or include an increase to base teacher pay, both ideas that received much attention during the beginning of the session. Evergreen will be experiencing a negative fiscal impact in ‘backfill’ tuition revenue from the tuition reduction plan passed in 2015. Due to lower than projected enrollments, we have a loss of $132,000 in state funding. The 2016 regular legislative session adjourned last night with the House and Senate at odds over a supplemental budget agreement. Immediately following adjournment, Governor Inslee issued a proclamation calling the legislature back into a special session, starting immediately. Special sessions have become the norm in Olympia, with 5 of the last 6 sessions resulting in at least one special session. Following announcement of the special session, Governor Inslee held firm on a previous promise to start vetoing bills if the legislature did not reach an agreement on the supplemental budget by the end of business on March 10th. In total, 27 bills were vetoed. The bills covered a wide range of topics, from wholesale vehicle dealers to the growing of industrial hemp. Most had passed unanimously. Only two bills of those vetoed impact higher education, SB 6466 relating to services for students with disabilities and SB 6354 concerning reverse articulation agreements. The Governor also signed 10 bills, all relating to health and public safety. With much work left to do on both the capital and operating budgets, both chambers continue to work to reach a deal with hopes of sending a budget to the governor’s desk within the next few days and avoiding any additional exercise of veto power. The final day of the 30-day special session will be Friday, April 8th. On Wednesday the Senate released their 2015-2017 supplemental budget proposal, the third and final proposal before negotiations between the House and Senate begin. Now the legislative leaders must work to come to an agreement that both chambers can agree on. The Senate budget, penned by the Ways & Means Chair Andy Hill, adds about $49 million overall to the two-year $38 billion budget that was adopted last July. Unlike the proposals by Governor Inslee and the House, the Senate budget does not repeal or limit any tax exemptions. The Senate budget, much like the House budget, continues the commitment the legislature made last year in SB 5954 to reduce tuition in Washington’s institutions of higher education. The Senate budget goes one step further to ensure the funding, or ‘back fill’, provided by the state for the lost tuition revenue is accurate for each school based on actual enrollment numbers. For Evergreen, this would reduce our biennial appropriation by $132,000. On Thursday evening the House moved their budget off of the floor with a 50-47 vote and over 50 amendments offered. The Senate budget was passed out of the Ways & Means Committee last night during Executive Session and is expected to be heard on the Senate floor today. Today is the opposite house policy cut off, meaning all of the Senate bills need to be passed out of the House policy committees and all of the House bills must be moved out of the Senate policy committees for the bills to remain ‘alive’. Monday is the fiscal cut off, the final cut off date before the legislature moves into the home stretch with 10 days of floor action. On Monday, the 43rd legislative day, the House of Representatives released their 2015-2017 supplemental operating budget proposal. The House was the first since Governor Inslee’s supplemental budget was released in December. With Representatives Pat Sullivan, Kristine Lytton, and Timm Ormsby beside him, Representative Hans Dunshee, the Appropriations Committee chair and chief budget writer for the House, called the proposal “a balanced budget that meets our constitutional and moral obligations”. The plan, penned by House Democrats, includes funding for Representative Hansen’s Free to Finish program for students 15 credits or less shy of their degree who have been out of school for three or more years. Overall, the budget proposal maintains funding levels for higher education as set in the biennial budget signed by Governor Inslee last July. New investments are focused in early learning and K-12 education, mental health, homelessness and response to state-wide emergencies. The plan utilizes additional revenue from the closure of tax exemptions on real estate excise tax and sales tax for non-residents ($56.3 million), repealing the tax exemption on bottled water ($23.2 million), and repealing the preferential B&O tax rate on resellers of prescription drugs, international investment services, and travel agents and tour operators ($40 million). The Senate budget is expected later this week. Once both budgets are release the House and Senate can begin the collaborative budget writing process in hopes of wrapping up the final budget by March 10th, the last day of the regular legislative session. SB 6409 passed off of the Senate floor with a 46-3 vote on Tuesday evening, the 37th day of session. The bill, sponsored by Senator Barbara Bailey of Oak Harbor, would create efficiencies in higher education by streamlining processes and eliminating unnecessary reporting requirements. This legislation is the product of many years of collaborative work by Evergreen, Western, Central, Eastern, UW, and WSU. Art in Public Places: An institution of higher education may expend up to 10 percent of the one-half of one percent during the design phase of a project, in order to integrate the art in the building design. The one-half of one percent to be expended by the Arts Commission must be adjusted downward by the amount expended by the institution during the design phase of the project. Capital Budget: The minor works project threshold for higher education institutions is raised from $2 million to $5 million to keep up with project cost inflation and better address the growing backlog of preservation projects. Procurement and Contracting: Institutions of higher education that exercise independent purchasing authority for commodities are not required to notify the Department of Enterprise Services. The institutions may develop independent training or certification programs, or both, to ensure consistency in procurement practices. Each institution exercising its authority to develop independent training or certification must require employees responsible for procurement to complete the training or certification program. Research Records: Institutions of higher education are exempted from the laws governing the release of individually identifiable records for research purposes. SB 6409 will now head to the House Higher Education Committee for a hearing, which has not yet been scheduled. This morning the Washington State Economic and Revenue Forecast Council released their February revenue forecast, predicting a $78 million decline in revenue collections for the current biennium. The decline in collections is due to weak economic growth on the national and global level. This morning’s forecast marks the first time in two years that the council has lowered their projection for the current biennium. In addition to lowering the projections for the current biennium, the council also lowered their forecast for the 2017-2019 biennium by a significant $436 million. For more details on the economic outlook for Washington, you can view the full report by the Economic and Revenue Forecast Council. The next revenue forecast is scheduled for release on Wednesday, June 15th. February 5th marked the first major hurdle in the 2016 Legislative Session- the house of origin policy cutoff! This means that all of the Senate bills needed to have been passed out of the Senate policy committees and onto the fiscal committees or the Rules Committee in order for the bills to remain in play or ‘alive’ as we continue along in session. The same goes for House bills in House policy committees. If a bill was not passed out of committee by last Friday, it is considered ‘dead’. The only exception to this rule is if the budget writers decide a bill is necessary to implement the budget, or NTIB.